This is a very big thing in Korra's life. I think that Armond is a BIG FAT LIER! I mean, he can't talk if he has no face! Asami's a non-bender so they are pretty awesome. 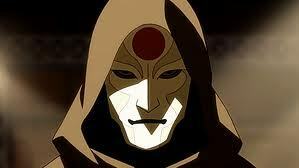 I think Amon is a bender he's just lying to gain trust and power. After all energybending is how you take away bending. u sure? I thought you just wear out your opponent until they can't bend! Yup, pretty sure. That's how Aang did it anyways. Chi blockers are the ones who just ware you out. I was talking to lord1bobos, and I know you're a girl. I love the non-benders like Sokka and Asami, but bending is really awesome! I don't think Amon actually meant he was faceless- just that it was severely burned. I'm not saying I believe his face is truly burned or not, though. While I have a strong feeling that he lied to the crowd for sympathy (even if I don't want to believe that), I don't think he's secretly a bender or anything of that sort- his hatred towards bending seems way too strong.